The Mulder House has an almost square plan assembled from three interlocking rectangular volumes. The ground floor consists of a large L-shaped living room with adjoining kitchen. The brick cladding alternates between white and light grey with a black plinth below the large expanses of glass. A black-painted steel H-beam separates the projecting roof planes from the walls. The wooden window frames are white with touches of blue. Above the entrance (with a red service hatch, now sealed off) is a frosted glass window delivering daylight into the entrance through a lowered glass ceiling. Similarly, a row of roof lights in the taller volume delivers daylight onto the frosted glass ceiling of the bathroom. 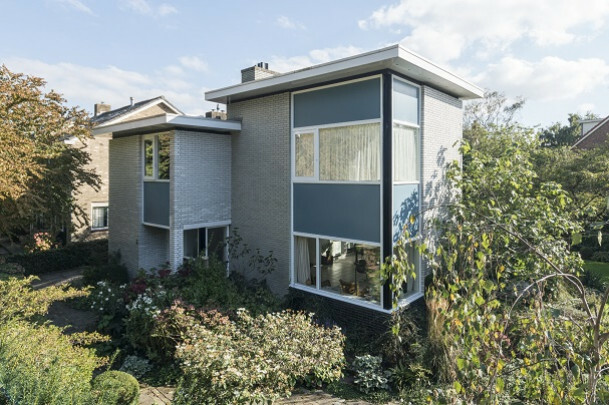 The colour scheme of the steel columns bearing aloft the balcony on the south-facing side is the same as that of the slightly earlier Holiday House in Noordwijk : white on the inside and black on the outside.